Memory management in C is viewed by some to be quite tricky. One needs to work with pointers that can point anywhere in memory, and if misused, cause a program to misbehave, or worse. The basic functions to allocate and deallocate memory in C are malloc() and free() respectively. The malloc() function takes a size in bytes of how much to allocate, and returns a pointer to the allocated memory to be used. Upon failure, a null pointer, which can be thought of as a pointer pointing to 0 is returned. The free() function takes the pointer returned by malloc(), and deallocates the memory, or frees up the memory it was once pointing to. Unfortunately many experienced programmers forget to handle the failure scenario. I've even heard some say they purposely don't, as they have no clue how to proceed, and just letting the program crash is good enough for them. If you meet someone who makes that argument, revoke their programming license. We don't need such near sighted idiots writing libraries. In any case, even the above can lead to some misuse. After this block of code runs, what is p now pointing to? After the above code runs, in the case that malloc() succeeded, p is now pointing to memory in middle of nowhere, and can't be used. This is known as a dangling pointer. Dangling pointers can be dangerous, as an if clause as above will think the pointer is valid, and may do something with it, or lead to the infamous use after free bug. This becomes more likely to occur as the situation becomes more complicated and there are loops involved, and how malloc() and free() interact can take multiple paths. Pointers involved with memory management should always be pointing at 0 or at allocated memory. Anything else is just asking for trouble. Therefore, I deem any direct use of free() dangerous, as it doesn't set the pointer to 0. So if free() is considered harmful, what should one use? It makes use of the preprocessor, so some may consider it messy, but it can be used wherever free() currently is. One could also name the macro free in order to automatically replace existing code, but it's best not to program that way, as you begin to rely on these semantics. This in turn means someone copying your code may think a call to free() is the normal free() and not realize something special is occurring when they copy it elsewhere without the macro. If you think using a wrapper macro or function is overkill, and just always manually assigning the pointer to 0 after freeing is the way to go, consider that it's unwieldy to constantly do so, and you may forget to. If the above technique was always used, all use after free bugs would never have occurred in the first place. Something else to be aware of is that there's nothing wrong with calling free(0). However, calling free() upon a pointer which is not null and not pointing to allocated memory is forbidden and will crash your program. So stick to the advice here, and you may just find memory management became significantly easier. If all this talk of pointers is beyond you, consider acquiring Understanding and Using C Pointers. 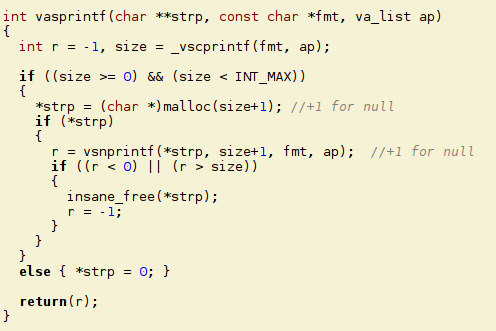 If you do a lot of C programming, at some point, you probably have used the sprintf() function, or its safer counterpart snprintf(). These two functions sprintf() and snprintf() act like printf(), but instead of printing to the standard output, they print to a fixed-length string buffer. Now a fixed-length string buffer is great and all, but what if you wanted something which automatically allocated the amount it needed? Enter asprintf(), a function which acts like sprintf(), but is auto-allocating, and needs no buffer supplied. 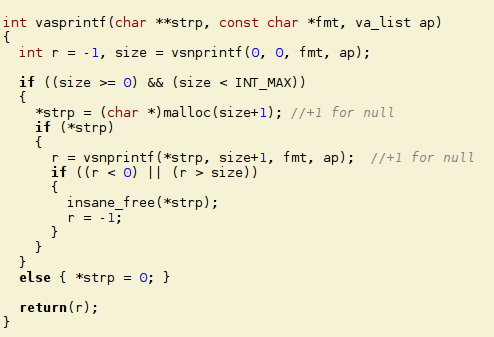 This function was invented ages ago by GLIBC, shortly thereafter copied to the modern BSDs, and found its way further still into all sorts of libraries, although is not yet ubiquitous. But its creators wanted to make it act like sprintf(), and its design can also be potentially more useful. Of course though, the above taken verbatim would be incorrect, because it mistakenly assumes that nothing can go wrong, such as the malloc() or snprintf() failing. First let's better understand what the *printf() functions return. Upon success, they return the amount of characters written to the string (which does not include the trailing null byte). Or in other words, the return value is equivalent to calling strlen() on the data being output, which can save you needing to use a strlen() call with sprintf() or similar functions for certain scenarios. Upon failure, for whatever reason, the return is -1. Of course there's the above mentioned exception to this with snprintf(), where the amount of characters needed to contain the output would be returned instead. If during the output, the size overflows (exceeds INT_MAX), many implementations will return a large negative value (failure with snprintf(), or success with all the functions). However, unlike the other functions, asprintf() has a second return value, its first argument, or what the function sees as *ret. To comply with the memory management discussion above, this should also be set to 0 upon failure. Unfortunately, many popular implementations, including those in GLIBC and MinGW fail to do so. Since I develop with the above systems, and I'm using asprintf() in loops with multiple paths, it becomes unwieldy to need to pass around the buffer and the returned int, so I'd of course want saner semantics which don't leave dangling pointers in my program. In order to correct such mistakes, I would need to take code from elsewhere, or whip up my own function. Now I find developing functions such as these to be relatively simple, but even so, I always go to check other implementations to see if there's any important points I'm missing before I go implement one. Maybe, I'll even find one which meets my standards with a decent license which I can just copy verbatim. In researching this, to my shock and horror, I came across implementations which properly ensure that *ret is set to 0 upon failure, but the returned int may be undefined in certain cases. That some of the most popular implementations get one half wrong, and that some of the less popular get the other half wrong is just downright terrifying. This means that there isn't any necessarily portable way to check for failure with the different implementations. I certainly was not expecting that, but with the amount of horrible code out there, I guess I really shouldn't be surprised anymore. Also in the course of research, besides finding many implementations taking a non-portable approach, many have problems in all sorts of edge cases. Such as mishandling overflow, or not realizing that two successive calls to a *printf() function with the same data may not necessarily yield the same results. Some try to calculate the length needed with some extra logic and only call sprintf() once, but this logic may not be portable, or always needs updating as new types are added to the format string as standards progress, or the C library decided to offer new features. Some of the mistakes I found seem to be due to expecting a certain implementation of underlying functions, and then later the underlying functions were altered, or the code was copied verbatim to another library, without noting the underlying functions acted differently. So, once again, I'm finding myself needing to supply the world with more usable implementations. Let's dive into how to implement asprinf(). To fix the aforementioned return problems, one could also easily throw in here a check upon the correct return variable used in the underlying vasprintf() implementation and use it to set the other. However, that's not a very portable fix, and the underlying implementation of vasprintf() can have other issues as described above. As long as you have a proper C99 implementation of stdarg.h and vsnprintf(), you should be good to go. However, some systems may have vsnprintf() but not va_copy(). The va_copy() macro is needed because a va_list may not just be a simple object, but have handles to elsewhere, and a deep copy is needed. Since vsnprintf() being passed the original va_list may modify its contents, a copy is needed because the function is called twice. Be warned though that if your system lacks va_copy(), and a deep copy is required, using the above is a recipe for disaster. Once we're dealing with systems where shallow copy works though, the following works just as well, as vsnprintf() will be copying the va_list it receives and won't be modifying other data. Before we go further, there's two points I'd like to make. Some implementations of vsnprintf() are wrong, and always return -1 upon failure, not the size that would've been needed. On such systems, another approach will need to be taken to calculate the length required, and the implementations here of vasprintf() (and by extension asprintf()) will just always return -1 and *ret (or *strp) will be 0. The code if ((r < 0) || (r > size)) could instead be if (r != size), more on that later. Now on Windows, vsnprintf() always returns -1 upon failure, in violation of the C99 standard. However, in violation of Microsoft's own specifications, and undocumented, I found that vsnprintf() with the first two parameters being passed 0 as in the above code actually works correctly. It's only when you're passing data there that the Windows implementation violates the spec. But in any case, relying on undocumented behavior is never a good idea. On certain versions of MinGW, if __USE_MINGW_ANSI_STDIO is defined before stdio.h is included, it'll cause the broken Windows *printf() functions to be replaced with C99 standards compliant ones. Lastly, let me return to that second point from earlier. 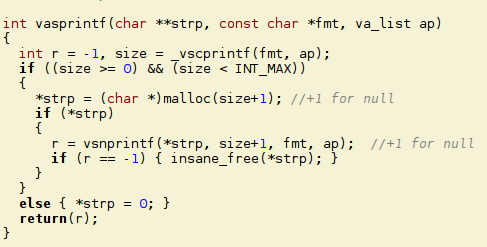 The vsnprintf() function call the second time may fail because the system ran out of memory to perform its activities once the call to malloc() succeeds, or something else happens on the system to cause it to fail. But also, in a multi-threaded program, the various arguments being passed could have their data change between the two calls. Like the first implementation, if all you lacked was va_copy(), and shallow copy is fine, it's easy to get this to work on your platform as described above. But if vsnprintf() isn't implemented correctly (hello MSVC), this will always fail. All the code here including the appropriate headers, along with notes and usage examples are all packed up and ready to use on my asprintf() implementation website. Between everything offered, you should hopefully find something that works well for you, and is better than what your platform provides, or alternative junk out there. As always, I'm only human, so if you found any bugs, please inform me. Code as images? I thought that you were better than that. As part of the continual degrade of Blogger, it is now very difficult to post code into posts, especially if they contain < or >. As a new problem with Blogger that I saw for the first time writing this article, formatting now also randomly changes. 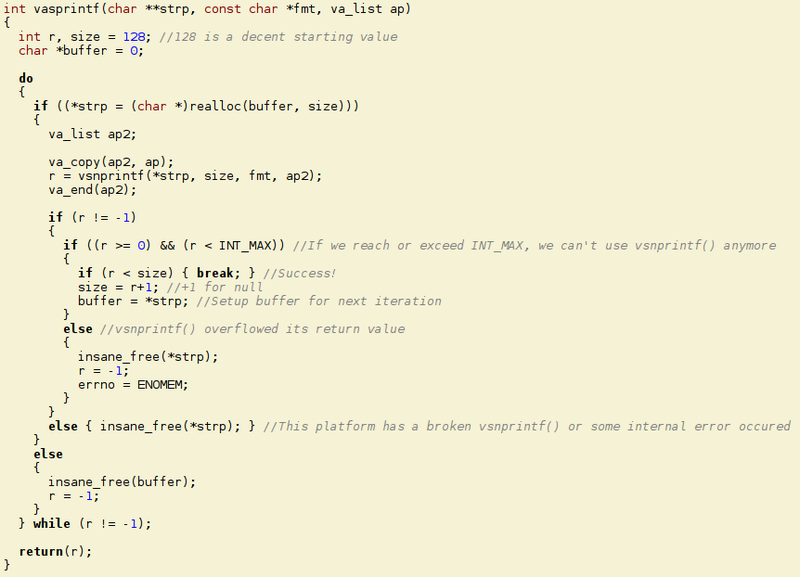 You'll notice the #ifdef code has weird spacing which I couldn't fix without it degrading into something worse. After trying half a dozen times to get the large code samples to display correctly, I gave up and resorted to images. In any case, I link to a location you can get the code as text in a tidy package. Due to the issues here though, I probably will one of these days take my articles to my own server, with my own blogging software which I can properly manage instead of the nightmare Blogger has become. Interesting article. 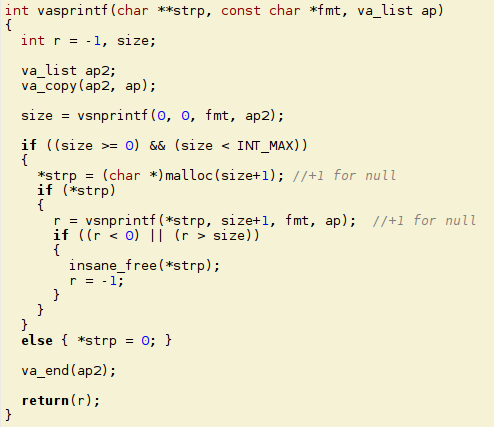 I never considered that variable arguments in C might require a deep copy. Would you happen to know of a scenario where this is the case? Offhand, Linux on AMD64 requires it. To me all this says to use C++ strings wherever possible. this page of yours - http://asprintf.insanecoding.org/ - that I found on a DuckDuckGo search did not contain any contact information and neither did the blogspot.com blog of yours. See http://www.shlomifish.org/meta/FAQ/#obscure_email_addr . As a result I have to resort to posting a comment here that there's a typo there - "aquire" should be "acquire" - see https://en.wiktionary.org/wiki/aquire . Please correct it and please include some form of contact information on your web-sites. Thank you for catching that typo, it has been fixed.